NASA has so may wonderful resources that you can use in your classroom. I saw this great website (link) that compared the Earth and Mars using a chart with detailed infographics. Using the information posted, I created a ppt to go along with the website and a cut-n-paste activity worksheet for their notes. 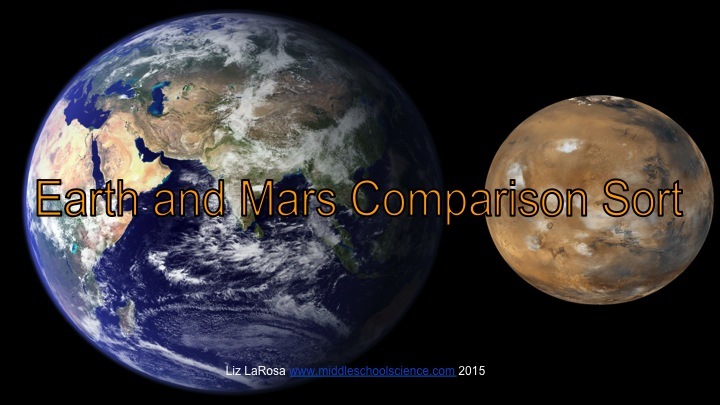 Each student will receive a blank Earth and Mars comparison chart. They will cut out the facts and sort them into either the Earth or Mars column, and place them next to the categories that are found in the center of the page: such as Diameter, Gravity, and Length of Day. They can work with their partner to discuss their ideas as they sort through the facts. Once everyone was ready, we went over the answers as a class. If the student had the answer in the right position, they glued it into their notes. If it was incorrect, they placed the fact to the side for later and put the right answer into its place, and glued it on. The next day, I asked the kids to recall facts about Mars and Earth before they opened their notes and I was happy with how much they were able to remember from doing this activity.